Each spring for the past 15 years, I have had the honor and privilege of traveling to Pigeon Forge, Tennessee, to participate in book selection for Dolly Parton’s Imagination Library. It’s my favorite meeting, and I look forward to it each year. Dolly Parton initially founded the Imagination Library as a way to benefit the children of Sevier County, Tennessee, where she grew up. She credited reading with helping her envision the wider world beyond her isolated mountain home. Through her generosity, every child in the county receives a book a month from the time they are born until their fifth birthday. This means that each child enters kindergarten owning a personal library of 60 books. Over time, other communities wanted to implement the program. Funded by state or local governments, local United Ways, banks, and other donors, the program now operates in hundreds of communities throughout the United States, Canada, and the United Kingdom. Operated by the nonprofit Dollywood Foundation and using books published by Penguin/Random House (which has both a rich collection of classic titles and a broad selection of new books each year), the program now distributes more than a million books every month. It is poised to distribute its 100 millionth book early in 2018! For three days each May, the Book Selection Committee meets to choose the books that will be included in the program for the next year. We read and discuss roughly 100 new books and debate which might replace books that are currently in the program. Always, we keep in mind factors such as the developmental stages of the recipients, racial and gender diversity, and which books we believe will truly stimulate the imaginations of young readers. Getting together with the other members of the Book Selection Committee is like meeting old friends from camp for an annual reunion. And exploring so many great children’s books is an energizing experience. The staff of the Dollywood Foundation provides wonderful hospitality. Some years, if she’s in town, Dolly even stops by to greet us. She takes great pride in the Imagination Library and the impact it has on children’s lives. To learn more about the Imagination Library, visit the project’s website. As for me, I’m already looking forward to the 2018 meeting! It’s hard to believe it’s been nearly six years since I left the International Literacy Association to pursue my second “dream job” as a children’s book author and freelance writer/editor. I’ve found this new career exhilarating, challenging, and immensely rewarding. I’m up to 32 published books for children and young adults, with more on the way. I’ve found a niche doing elementary-level history and social studies titles for Capstone, an educational publisher. In 2016 I had books come out about the Civil War, the War of 1812, the Pennsylvania Colony, Explorers and Native Americans, People and Places of the Northeast Region of the U.S., and People and Places of the Southeast Region of the U.S. There are at least five other Capstone books in various stages of production, and I hope to write more in the year ahead. This past year also marked the release of my second self-published book through my new First State Press imprint. 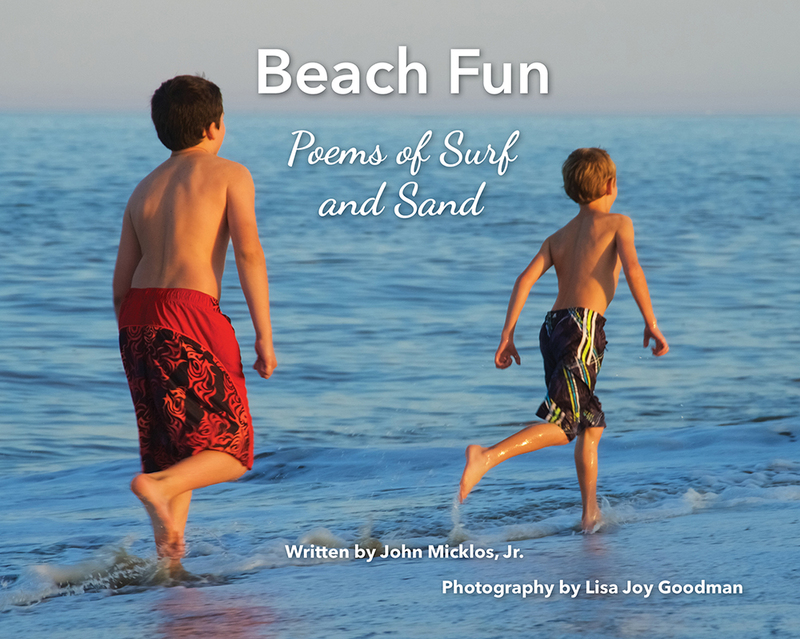 I partnered with award-winning photographer Lisa Goodman to produce Beach Fun: Poems of Surf and Sand, a book designed to appeal to beach loves ages 4 to 84. Lisa and I made several trips to the beach to do signings at bookstores and events. We hope to make another big push before summer 2017. I’ve also had an opportunity to do some interesting writing/editing work that takes advantage of my long background in literacy education. I do communications work for Read to Them, a nonprofit organization that builds family literacy and reading interest by getting all the elementary families from a school or school district reading and discussing the same children’s book at the same time. Hundreds of schools throughout the United States and Canada participate in One School, One Book and One District, One Book programs. This past year, I reconnected with Sakil Malik, a former colleague from ILA who now heads the Global Reading Network. Since June, I’ve been editing their online newsletter, organizing blog posts, and doing a variety of other writing and editing assignments. The Global Reading Network specializes in providing information and support for early grade reading in developing countries. I’ve really enjoyed this work, too! I love working with young students and sharing my writing with them. In 2016 I made multiple visits to Newark Charter Elementary School, talking to third graders about writing nonfiction and poetry. I also did visits or readings at John Bassett Moore Intermediate School in Smyrna, Mt. Pleasant Elementary School, William Cooke Jr. Elementary School, and ASPIRA Academy in Delaware and at the Penn-Delco School District in Pennsylvania. For 2017, I already have return visits scheduled at Newark Charter, along with day or evening programs at Newark Day Nursery and Wilmington Manor Elementary School. I am also in discussion with other schools, and I hope to add some more school visits over the course of the year. I’m really excited about a counting picture book I have coming out in September 2017. Titled One Leaf, Two Leaves, Count With Me, the book allows children to count along as leaves sprout on a tree in the spring and fall off in the fall. It concludes by showing new leaves once again budding on the tree the following spring. I am “counting” on the combination of counting and seasons making this book popular both in schools and homes. The book is illustrated by Clive McFarland, a talented young artist from Northern Ireland. When Nancy showed me samples from his book A Bed for Bear, I could tell immediately that his style was perfect for One Leaf, Two Leaves, Count With Me. The preliminary sketches bowled me over, and the almost-finished book is stunning. The book came to me in a flash during a writer’s retreat sponsored by the Highlights Foundation in the fall of 2014. As I watched the final two leaves hanging onto a tree branch, these lines popped into my head: “One leaf, two leaves on a tree. Three leaves, four leaves, count with me.” I literally ran back to my cabin, and by that evening I had the text roughed out. This marked one of the handful of times in my life when I truly felt the magic of the muse, and I feel truly blessed with the result. Watch for further updates about One Leaf, Two Leaves, Count With Me in the months to come—along with other writing news. I think 2017 will be a banner year! Celebrating Summer with Beach Fun! Beach season is finally here! First State Press’s newest book, Beach Fun: Poems of Surf and Sand, pairs my poetry with gorgeous photographs by Lisa Joy Goodman to capture the magic of a day at the seashore. The poetry is appropriate for children 4-12, but will appeal to beach lovers of all ages. To support the book’s launch, Lisa and I are doing a series of book signings throughout June. If your travels take you near any of the places listed below, stop by and say “hi.” We’d love to see old friends at these events, even as we make new ones. Can’t come us in person but still want a signed copy of Beach Fun for your collection or to share with a friend? Order your copy now at the First State Press website. Just $21.95 will bring a signed copy shipped directly to your door anywhere in the United States. Enjoy the summer with some Beach Fun! On Teacher Appreciation Week, I would like to thank just some of the teachers and mentors who helped me on my way to becoming a published writer. I wrote my first “book,” a 20-page story titled “Tubby the Pig on the Moon,” when I was about 8 or 9, encouraged by my third-grade teacher, Mrs. Painter. In high school, Mr. Cressman read all of my poor attempts at emulating romantic poets such as Wordsworth and Blake, and Ms. Huddy encouraged my love of journalism. At Ohio University, I had the privilege of taking creative writing classes with Daniel Keyes (Flowers for Algernon). and Walter Tevis (The Hustler and The Man Who Fell to Earth). Keys gave me a C+, the lowest grade I earned during my entire college career, showing me I was not nearly as good a writer as I thought I was and forcing me to hone my craft. Tevis taught me about characterization and strength of story. At the International Reading Association, I thank Drew Cassidy, who hired me for my first professional writing job. I intended IRA to be a two-year stop on my way to other things and ended up staying more than 30 years! I also thank Lloyd Kline, who reminded me that sometimes writers need to set a project aside for a couple of days so they can “get their head around it”–advice I still heed today. As I began my career as a children’s book author, I thank Bernice E. Cullinan, who encouraged me to collect and write beautiful poems about fathers into a book of Daddy Poems–and then challenged me to turn the concept into a series of family-oriented poetry books. And I thank Kent Brown of Boyds Mills Press, who took a chance on a new writer and published those poetry books, launching a career than now includes more than 25 children’s books. There are many others who also contributed wisdom and/or encouragement along my “writer’s road.” My heartfelt thanks to all of you–and to all teachers who make a difference in so many lives every day!! Meanwhile, Beach Fun: Poems of Surf and Sand is now at the printer! Aimed at young readers ages 5-12, the book pairs my poems with exquisite photos by award-winning photographer Lisa Goodman. We hope to have the book in hand by early May. We are still seeking support with our printing costs. You can earn some cool incentives–signed books, note cards, and more–by supporting our GoFundMe project here. I was pleased to be featured on Education Talk Radio this morning, discussing the topic of the increasing use of nonfiction in elementary classrooms. Host Larry Jacobs asked me a wide range of questions about all of my children’s writing, and we had a lively discussion. You can access the entire interview on the Education Talk Radio website. Larry asked me how I got involved in writing for children, how I research and write nonfiction material for the education market, and how I handle the self-publishing process for picture and poetry books. For the latter question, I talked about developing The Sound in the Basement with our mutual friend, illustrator Eric Hamilton. I also discussed how much I enjoy visiting schools to talk about writing and to conduct writing workshops with elementary students. I described the joy I feel when I see a young reader/writer sharing my enthusiasm for a particular topic. To learn more about school visit topics, visit this page on my website. One topic that didn’t come up during our conversation was my next self publishing project, Beach Fun: Poems of Surf and Sand, produced in collaboration with award-winning photographer Lisa Goodman of Wilmington, so I’ll give that a quick plug here. We are currently conducting a GoFundMe campaign to help support our self-publishing effort. Learn more here. Publication of four new books through Capstone: The 1918 Flu Pandemic, The Challenger Explosion, Bold Riders: The Story of the Pony Express, and To the Last Man: The Battle of the Alamo. Six more Capstone titles are in various stages of production for publication in 2016! Acceptance of a counting book, One Leaf, Two Leaves: Count with Me, for publication by Nancy Paulsen Books in fall 2017. Paulsen’s Penguin imprint publishes award-winning books by distinguished authors such as Jacqueline Woodson, Tomie dePaola, and Rachel Isadora. Needless to say, I am delighted to be in such company, and I eagerly await the publication of my book, which is being illustrated by up-and-coming artist Clive McFarland of Northern Ireland. Watch for further details as they become available. Publication in September of The Sound in the Basement, a picture book about a young boy who overcomes his fear of going into the basement alone. The story is based on my own childhood experiences, and I worked on it off and on for nearly 15 years. I had a specific vision for how I wanted this book to look, so I decided to self-publish it through my brand-new imprint, First State Press. To turn that vision into reality, I teamed with artist Eric Hamilton, a long-time friend through the Association of Educational Publishers. Eric’s artwork lends just the right mix of fear and humor to the text, and we are both delighted with the finished product. To learn more or to order copies, visit www.FirstStatePress.com. Communications work with Read to Them, the nonprofit family literacy organization that runs the One District, One Book program. I have known Read to Them’s founder, Gary Anderson, for nearly 15 years, and I am delighted to support his efforts to spread the love of reading among families and school districts throughout the United States and beyond. Editing work with Delaware ShoutOut, a communications firm run by Newark resident Brooke Miles. I enjoy the work, and I learn something from each piece I edit. An article for ASCD’s Education Update newsletter on using primary sources in education. I really enjoyed the research and interviews involved in this piece. Working with graphic designer and longtime friend Mark Deshon to create a website for First State Press. Keynote speaker at the Young Authors’ Day conference at Keystone College in northern Pennsylvania in November, along with a school visit to Mountain View Elementary School in Kingsley, Pennsylvania. I already have several school visits lined up for 2016, and I look forward to scheduling more. I really enjoy sharing my love of writing with students. Presentations at the International Literacy Association conference and the Parents As Teachers (PAT) conference with Diane Givens of PAT on using children’s books and children’s poetry to help children cope with traumatic life experiences. Presentations at the State of Maryland IRA conference (on nonfiction) and the Keystone State Reading Association (on poetry). Looking ahead, 2016 will bring publication of several more Capstone titles and the publication of another First State Press book, Beach Fun: Poems of Surf and Sand. For this picture book, I have partnered with award-winning photographer and longtime friend Lisa Goodman. We anticipate a spring release. Watch for more details to come. As always, I am certain that many other exciting projects will arise, and I will post updates as more details become available. I look forward to an exciting writing year!